← Anatomy of a Song: Born in the U.S.A. There has been a lot of fretting in the last few years about the death of the novel, the death of the book. I’ve certainly had my own share of worries about this, given the way the major presses have shrunk, and given my inability to find a home for my novel (which is good, really, I swear, even though no one will publish it … moving right along…). Anyway, a few months back I was at Lit Crawl San Francisco, where I ran into my favorite MFA professor. I told him that I thought maybe the novel was on its way out as an artform. His response was, “People have been predicting the death of the novel since the novel was invented.” A few months after that I went to the Association of Writers & Writing Programs conference in Boston, where I spent three days wandering around the AWP Bookfair, which is essentially a massive convention center full of independent presses selling their books. It’s overwhelming; I needed a drink to deal with it (and yes, I need a drink to deal with most things in life … moving right along…), but in talking to the publishers and checking out the books and journals they were producing, I realized that this is where literature lives now. The major presses will continue to publish a few fiction novelists and poets, mostly established names, but the indies are the ones who will take the real chances, find the next trendsetters. And an upside of the technology boom is that it’s much easier to publish work independently now. (This is all true of the music and film industries as well). I bought a ton of books at AWP, and now, four months later, that I’ve read most of them, I thought I’d write about a couple of the indie presses that I think are producing outstanding work. The first one I’d like to talk about is Short Flight/Long Drive. Short Flight/Long Drive was founded in 2006 to be the book publishing side of the literary journal Hobart. The editors are proudly Midwestern, which partially explains the name–most cities in the Midwest are that short flight/long drive distance from each other. The books are small, 4″ x 6″, and mostly short story collections (a genre that major publishers avoid like the plague, unless the author is already famous, like George Saunders). 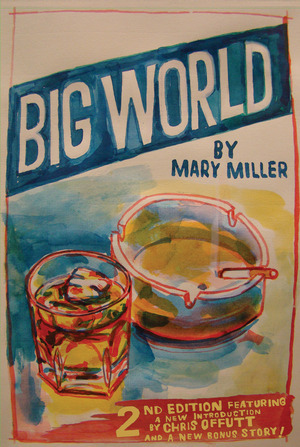 I bought two of their books at AWP: Big World by Mary Miller and Other Kinds by Dylan Nice. I loved both of these books. I was head-over-heels for Mary Miller’s book the moment I saw that cover. A whiskey on the rocks and a still-burning cigarette in the ashtray–it’s like every writer’s desk, at least those writers who aspire to Raymond Carver. Miller is definitely one of those. These stories are set mostly in the south, and are about young women and teenage girls who are lost and trying to figure out if they want to be found. The stories are sad, tinged with hopelessness, but tempered with the big-eyed view of youth trying to take in the whole big world. The prose is spare, unadorned, yet evocative; it reads a bit like the stuff Carver wouldn’t let his editor, Gordon Lish touch (if you’re curious about the Carver/Lish history, the New Yorker had a great piece about it a few years back). It’s a great book, and Miller is a rising star: She got a Michener Fellowship at the University of Texas and sold her first novel to a major publisher, W.W. Norton. Keep an eye out for her. 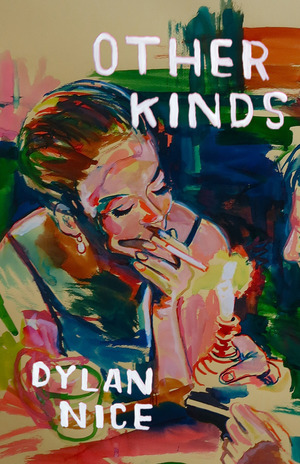 The cover of Dylan Nice’s Other Kinds was designed by David Kramer, the same artist who did Big World, and there’s a synergy between the stories in the two books. The stories in Other Kinds are mostly about young men from Appalachian coal mining towns who find themselves in other places (from college towns to different continents) yet still carry the weight of their roots. Aesthetically, the prose comes from the same school as Miller’s, though Nice’s work carries a more explicit Hemingway influence (there are italicized interludes between stories, a la In Our Time). Of course, if you know me at all, you’ll know that I think Hemingway is about the best influence a writer can have. So, I loved both of these books and gave them both 5-star ratings on Goodreads. And aside from the simple pleasure of reading a really good book, Miller, Nice, and Short Flight/Long Drive give me hope. I don’t see why major publishers don’t gobble up books like these, and why millions of people don’t read them, but as long as there are small presses putting out this kind of work, literature is alive and well. This entry was posted in Books, Writing and tagged awp, literature, small press. Bookmark the permalink.